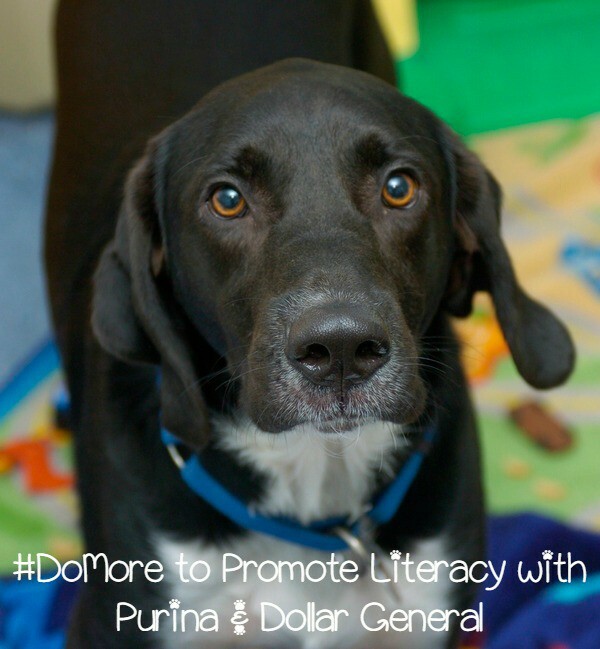 #DoMore With Your Dollar & Improve Literacy with Purina at Dollar General! You know that I’m pretty opinionated about literacy, right? I think that encouraging kids to read is one of the greatest gifts we, as parents, can give them. Knowing how to read isn’t just a valuable life skill for things like basic education and future employment opportunities, it gives our children the chance to explore endless realms and expands their imaginations beyond the furthest reaches of our own universe. Did you know that studies have shown that when children read to their pets, their reading skills and confidence improves? Purina has always been passionate about pets. Now, they’re taking that passion and directing it towards literacy as well. Purina partnered with Dollar General to help drive awareness to the importance of literacy. Even better, they did it in a way that also helps you do more with your dollar! During April, you can grab four digital coupons for Purina products and use them at Dollar General. For each coupon redeemed from from 4/5/2015 through 4/30/2015, Purina will donate $1 to the Dollar General Literacy foundation up to $20,000. The Dollar General Literacy Foundation is a fantastic organization that gives grants to nonprofits and schools that help teach people of all ages how to read, learn the English language or prep for the GED (high school equivalency test). Join the Purina & Dollar General Twitter Party for a Chance to Win Great Prizes! Ready to learn about how you can do more with your dollar AND improve literacy for children everywhere with the help of Purina and Dollar General? You won’t want to miss the #DoMore Twitter Party on 4/15 from 11AM-12PM EST! Just follow the hashtag (#DoMore) and your host @ModernDayMoms, along with your co-host, @SuburbanMomClub. Of course, every great Twitter party needs great prizes, right? Well, the #DoMore party has some AWESOME prizes, including $100 worth of FREE Purina food and litter at Dollar General! Even better: 15 people will win! That’s $1,500 worth of prizes! Check out complete contest rules for more info. RSVP below to let them know you’ll be there! Remember, it’s on Wednesday, April 15th at 11AM EST. What do you do at home to encourage literacy? Tell me in the comments! This is great. I do believe that children’s literacy goes up when reading, even if it is to their pup. Great coupons and makes me wish we fed our dogs Purina just so we can have the savings. I agree. I think that even reading the back of a cereal box improves literacy! I expect my son to keep up with his required reading at school, but at home, anything with words and, preferably, complete sentences, is fair game. I love that this is getting kids reading more and helping support them. This sounds like an amazing twitter party with great prizes. We love the Purina brand for our cat and love that they are partnering up with Dollar General like this! I totally agree that encouraging kids to read is one of the greatest gifts that will last for a lifetime. Having kids read to pets makes perfect sense, but I’ve never heard anybody suggest this idea before. Good luck with the project and twitter party! I really liked it. Kids reading animal definitely will improve their reading quality and i think they will also improve with their stage skills and talking in front if huge audiences . This sounds like a fantastic thing to support and well done to Purina for giving back in this way. Learning to read is such an important life skill and it’s truly saddening that so many children and adults have not been given the chance or support that they need to learn to read. Reading is something we’re passionate about as a family so this is something I’d be delighted to support. It is sad, especially when there are so many resources to help everyone of all ages learn to read. It’s such an important skill, and there are literally millions of ways to dive into reading. I love the idea of children reading to their pet! I never would have thought of it, even though I remember reading to my stuffed animals as a kid myself. I’m so happy to hear that Dollar General has a literacy foundation, and they’re using this opportunity to do so AND save their shoppers money! Aww, how cute that you read to your stuffed animals! I think animals- live and plush- make a great audience to help give kids the confidence they need to boost their reading skills. It is so important for children to learn how to read from early on, this is something my parents made sure we knew growing up. I an not familiar with Dollar General but thanks for the info. I’m glad to hear your parents encouraged reading from an early age! My mom and grandparents did the same and I feel like it really helped make me the person I am today. I think it is a great idea to read to pets! They will enjoy it also. Whatever it takes to get children to enjoy reading is terrific.